I feel the summer in the spring. The last week at school and the kids celebrated with a Pow Wow Play & end of year party. 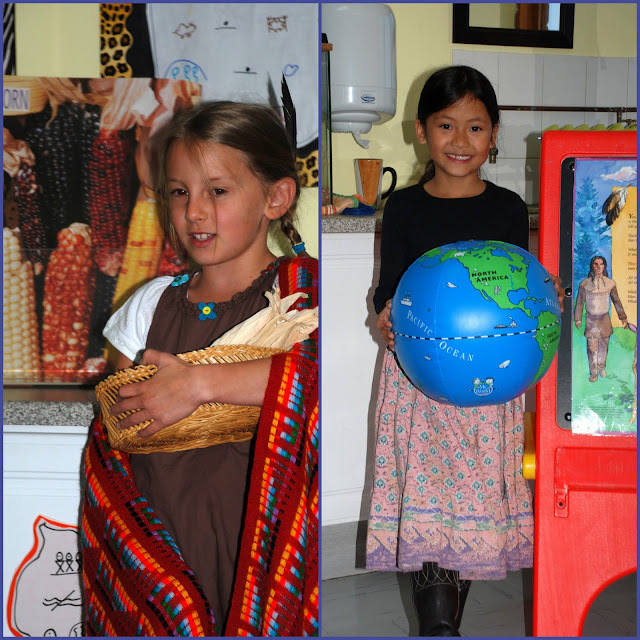 Each of the 4 second grade classes did a play and presentation about the Native Americans. A few months ago the kids did a native African play ~ maybe you remember the Shaka Zulu play, if not look here. 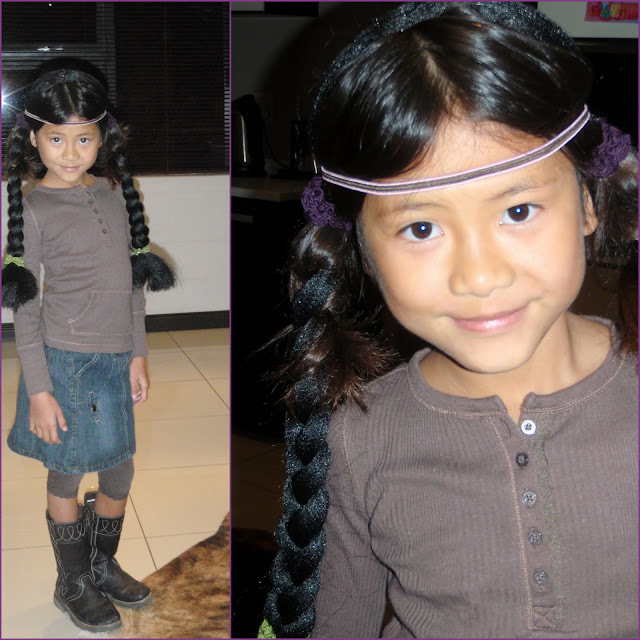 Juliet's class talked about the Hopi and Navajo Indians, trying to explain their foods, culture, way of living etc. So fun to see all the kids being emerged into their role. It was so fun! A typical village of the Navajo Indians, made by a friend and JJ. And the other class mates telling us about life as an Native American! Jasmine's class had a bit of a different set up, each child was pretending to work with seeds & beads, play an instrument or sew a garment, while a visitor came to their town and asked all these questions about how life was for the Iroquois Indians. The boys would play a certain flute to attract the attention of a beautiful girl, this is what they role play here. Jasmine is the beautiful girl who is smitten by Jason the suitor :-) Too cute!! By playing out these roles of some of the Native American tribes the children learned a lot about the way of living, habits, culture and surroundings. And in the meantime had fun with it! Afterwards, we gathered outside to have a little party with some traditional food like corn on the cob, popcorn, dried meat, fruit and other snacks to end the year with a bang! School is almost over and Jasmine and Juliet will go to the 3rd grade next year, time flies!! I hope they will get such a great teachers as this year, since Mrs. Kelley and Ms. Clark were the best! Thanks to both of you of giving my daughters a super duper year!! They will miss you! I tell you you must have the best schools there, it seems like your girls are always doing something fun that also teaches them something too! As a teacher, I love seeing all the fabulous multi-cultural experiences your girls are having in school. They are truly citizens of the world! It's also refreshing that their teachers see the value in this social component of the curriculum. I'll bet your children and their classmates will be the kind of tolerant compassionate adults we'll want to be our leaders in the future. Just by being at school they already learn so much about different cultures. I mean just sitting in the cafetaria and seeing children eat with knife and fork, chopsticks or by hands dipping their bread into a stew... it is great to have 70 nationalities at school. Kids learn to not look at the color of the skin but at the person underneath the color! That's a big part why we became expats, so teach our kids that we live in a GLOBAL world. Ok, I see a little actress in our future! That face as she is being "enticed" by the flute, love it! What a great school and teachers for your girls! The pics are sooo great. Love the braids of Jasmine. Both look like they are really into their characters. What a wonderful and fun way to learn about a different culture!